My sister always thought that yoga solves all of life’s problems. Of course she would say that, as a yoga teacher. But even before she started teaching she’d drag me to her favorite yoga classes and try to get me to drink the Kool-Aid. I always cringed at the thought of sitting in quiet room with only my thoughts to keep me company. Little did I know how wrong that was. As an ex-competitive dancer and lover of fast paced workouts I never thought I’d see the day where I actually enjoyed a yoga class. But thanks to the fast paced ashtanga based practice, rocket yoga, I started to love yoga. Rocket is full of headstands, forearm stands, many arm balances and the beloved handstand. However, if you can’t do any of these tricks, don’t panic— rocket yoga contains countless poses you can do instead that are easier and work the same muscles. “In the Rocket practice, there are so many opportunities for challenges, and the routines themselves workout the stress muscle, the cognitive/emotional functioning that helps us build and demonstrate resilience and strength in life,” said 405 Yoga Studio owner Meredith VanSant. For all those fitness lovers out there, you know the drill of finding a new workout. I was always a fan of cardio like running or climbing the stair-master. But I wanted to get back to more strengthening and consistent workouts that reminded me of my old days at the ballet bar. And that led to my rocket yoga finding. This is my sister in a scorpion forearm stand. “I encourage anyone who doesn’t have a yoga practice to try different types of practices and teachers until you find one that you love. There are over 200 types of yoga practices, and the results of the practice are too good to pass up,” said VanSant. You may not believe me, but even in a short month I feel much differently physically and spiritually. I have noticed my stomach starting to tone again. I’m finally getting abs back after years of replacing dance with college happy hours and pizza eating. I also feel definition in my arms, something I have been working on for years. Along with the physical aspect, I rarely get lower back pain anymore. On a spiritual level, I treasure the time I get away from my phone when in yoga. The yoga room is a quiet place where I solely focus on myself and my goals. Beyond that, I am the type of person who can sometimes dwell on the negative and alter my self confidence, but yoga can help with that. 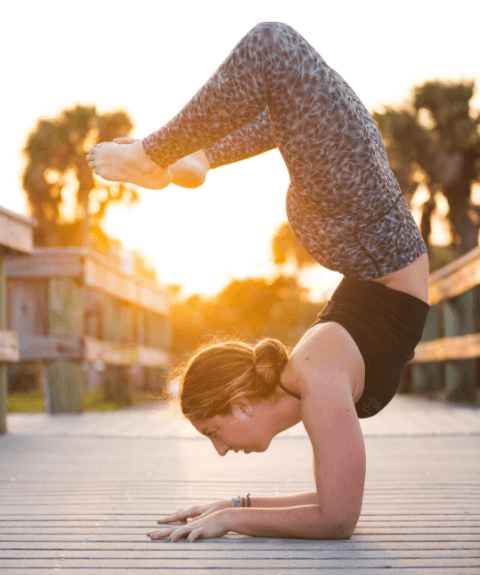 “Yoga can reduce or help manage depression, anxiety, aid in eating disorder prevention and recovery, the afflictions we’re statistically more likely to experience in young adulthood that at other times in our lives,” said VanSant. Rocket yoga helped me get past these feelings and realize how strong my body is. Last, I’ve always been the type of active person where I need a practice I can improve upon. I like to set goals and see them come alive— I mean who doesn’t like to see improvement in their fitness? For me, I wanted to first master this cool arm balance that looked great in Instagram photos. I was always so close. And then one day, during my sister’s class I yelled her name to watch me stick it and master it. I felt overwhelmed with joy that I finally mastered the first pose I set a goal for. Just like most sports, yoga allows you to come in forget about your worries for the day and just have fun. “Rocket attracts the most badass people. Our community is full of them. [I] am so glad we get to serve such strong people everyday,” said VanSant. That sounds like my kind of zen.